Jamaica has so much to offer, it will definitely take more than one vacation to experience it all. And that is regardless of the type of vacation you are looking for; there are scores of activities to suit every taste and lifestyle, including yours. Adventure options here are plenty, exploratory travelers rent bikes, bicycles, scooters and cars, while others use taxis and buses for a more organized trip. For some interesting adventure options, visit this page. By the way, for the very brave and adventurous the first ever drop zone is now open for business in Portland, east of the island. Beach-going has been a captivating experience for many locals - never mind the tourists! The Doctors Cave Beach in Montego Bay is a great option. By the way, historically, it was known for its medicinal properties. Snorkeling, diving, sailing or simply basking in the sun on the sand or in the water is among the popular fun-filed experience on our beaches. In Montego Bay, make sure you see the Widows makers cave, Sunken Ship reef in Ocho Rios, Sunken City of Port Royal which was destroyed by the major earthquake in 1692. In fact, for the true snorkeling lover, Royal Reef, Coyaba Sea World and Doctor’s Cave Beach are know to be among the best. That said, you may however just choose to stroll the beaches, for example, the 'seven-mile' of beautiful and pristine white sandy beach in Negril - adorned with entertaining and fun activities all the way. Clubbing in Jamaica has seen a tremendous growth over the past few years. Club life exudes the genuine Jamaican party vibe. Clubs are in every nook and cranny of the island but some the more appropriate ones to visit are probably: Margueritaville - in Montego Bay, Negril and Ocho Rios, provides unique clubbing, water sports and an excellent dining experience, Club Asylum and The Quad in Kingston, and The Jungle in Negril. For the more religious, there are lots of churches and places of worship on the island. There are representatives of every denomination here. And by the way, Jamaica does have the record for the most churches per square mile. More in the facts about Jamaica. The prime worship days are Saturdays and Sundays with various worship times. Culturally, Jamaica is rich, very rich and so, there are several festivals that showcases the rich and diverse history of Jamaica. The Westmoreland Curry festival, Jerk fest, Coffee festival, Heritage fest and the Accompong Maroon Festival - held annually on Jan 6, are just a few. Other exciting musical festivals, such as Reggae Sumfest, Jazz n Blues Fest , Rebel Salute, Heineken Startime, etc, happens throughout the year and are a must see. Jamaica boasts some of the most world class sporting events such as golfing, tennis, cricket, football and fishing. Choose between 10 spectacular Golf courses exquisitely designed and other sporting events with a twist. Jamaica is also the home to 2 of the largest fishing tournaments held in September and October each year. More on Jamaican sports here. Shopping in Jamaica can be relatively cheap; you will find exclusive offers from local handmade crafts and goods, to imported designer jewelry, clothes and perfumes. Everything to make your dream vacation a reality is here on the island.The options are numerous, and possibilities endless! The choice is yours! 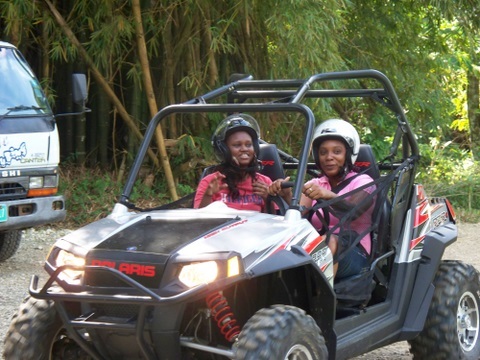 Here too is a short list of other tourist attractions you can find in Jamaica. By the way, make sure you visit Visit the Jamican Tour Guide page for hints and suggestions on how to select a guide. Return to vacation in Jamaica from activities in Jamaica. Visit the news and events page to get the latest of happenings and activities in Jamaica. Back to Top of activities in Jamaica.